In a human system, most of us follow a short set of “simple rules” that set conditions for the patterns we want to see across the whole system. These rules may be explicit or unspoken; they emerge from the system and work for everyone in the system over time (unlike “norms” that we might decide to follow for a particular event or in a particular context). In Radical Rules for Schools, we suggest some examples of these “rules” that seem to set conditions for authentic inquiry where everyone is learning. One of those rules is this: Engage in joyful practice! So much of education focuses on the big picture: the curriculum, lesson plans, preparing students to pass the “big” test, data in large quantities, accountability ratings. But often, I feel that tackling these issues can be overwhelming – especially when teaching ELLs, and even more so, those ELLs who are entering this country as high school students. I have very little time to prepare them for tasks that some students, who have only ever spoken English, sometimes have difficulty completing successfully. Even the students who are motivated and have been well educated in their native countries come to us with a deficit – they don’t speak English. If I think about the big picture – filling in missing background knowledge in addition to providing the skills and knowledge for their current grade level, it would be difficult to muster up any joy. So, I have learned to focus on the little things. It’s rare that I get to celebrate a great SAT score or entrance into a highly selective university with my students. Instead, what we celebrate is that the student made it to school for two weeks in a row without being tardy or absent. Sometimes we celebrate that he or she turned in a completed assignment on time for the first time. Sometimes we celebrate that the student read a whole book in English even if it was only 30 pages long and had pictures. Sometimes we celebrate that the student wrote a whole paragraph with no grammatical errors. And sometimes we celebrate that the student spontaneously and voluntarily spoke up in class. Maybe this is what all teachers do. We spend our days subconsciously tucking away all those little details that become our source of joy. You’d never be able to quantify or attach dollar signs to our small celebrations, nor gather all our details into an in-depth report full of data, percentages, or graphs and charts to be used for or against the latest political movement. But they certainly are what get us through the door every day. No one of them is more important than another; there is no sequence or hierarchy here. And every great teacher will have a personal preference–emphasizing the one works best for students. Like multiple ingredients of a delicious stew, each one contributes to the whole and each one can open possibilities for the others. For me, inquiry is the heart of the matter. Puzzles, paradoxes, and wonderings make good things happen–whether the learners are five years old or fifty-five. Questions fuel learning. This path is not always easy or safe. It’s much more comfortable to rely on what we know we know. Or what we think we know. Maker Movement for Kids This is just one of many links to projects and resources for educators who help students explore their worlds by making/creating/designing. Inquiry Beats Mastery! Zachary Chase talks about his teaching approach. 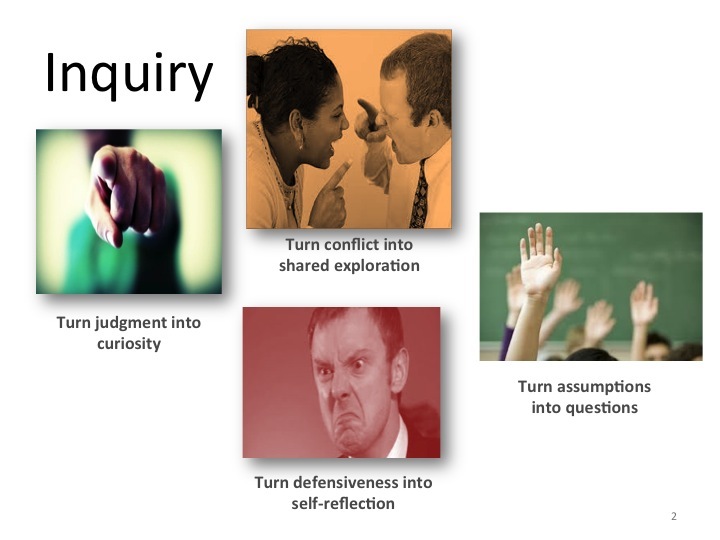 Let us know how inquiry shows up in your work? How do you invite students to ask important questions and to look for answers? Eoyang, G. & Holladay, R. (2013). Adaptive action: Leveraging uncertainty in your organization. California. Stanford University Press. Patterson, L., Holladay, R., and Eoyang, G. (2013). Radical rules for schools: Adaptive Action for complex change. Circle Pines, MN: Human Systems Dynamics Institute. Frank Smith has been telling us for decades that there are two main jobs for literacy teachers. First, make sure there is a literacy club alive and working in our classrooms. Second, make sure every learner is a full-fledged member of that club. That metaphor resonates for me. And it works across the disciplines. Math teachers lead clubs for young mathematicians. Science teachers lead clubs for novice scientists. Historians lead clubs for novice historians. Why? Because that’s the way human being learn. We learn best when we belong to a group of like-minded people–our partners in tasks that help us accomplish authentic goals. Frank Smith points out that when we join a club, we are immediately immersed in shared activities. Even novices are included in those activities, even if their activity is somewhat limited at first. As novice club members gain experience, they take on more and more responsibility for the work of the club. That is what “apprenticeship” means–whether in a club or in our classrooms. What does this mean for the way we teach? 1. Teachers show more than they tell. A demonstration is worth a thousand lectures. If I’m a history teacher, and I want my students to analyze a historical document, then I need to do it myself and talk them through my process. What did I think about? How did I look for patterns? What questions did I ask myself? What did I notice? Did I make lists? How shall I share what I’m learning with others? I save my long explanations and background information until the students’ questions tell me that they are ready. In a club, new recruits typically watch more experienced members lead the work and gradually begin participating fully in the work. 2. Teachers invite students to make mistakes as they learn. We expect novice club members to make mistakes. Teachers create spaces where it is safe for learners to make mistakes. We cannot create “risk-free” environments, and we shouldn’t try. We want to create time and space where learners can explore, investigate, and experiment as they learn our craft. We want learners to take the risks inherent in learning; we stand by to support their risk-taking. 3. 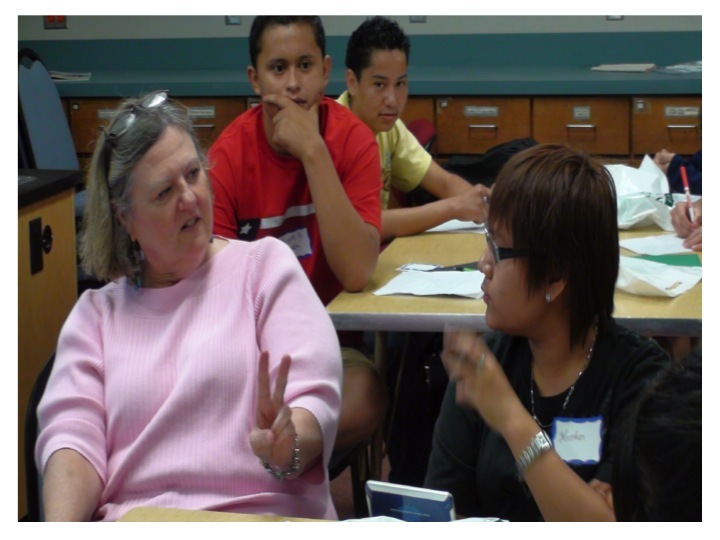 Teachers design instruction that anticipates what learners need to do next. . .and next. . . and next. WHAT are my students currently doing? What do they know? SO WHAT does that mean in terms of what they need to learn next? 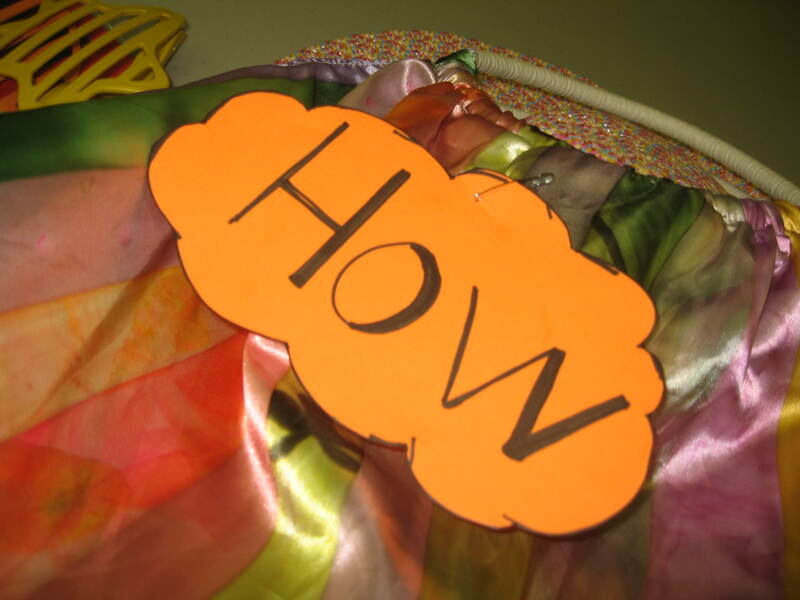 NOW WHAT shall I do to give them a task that is challenging, but within their learning zone? 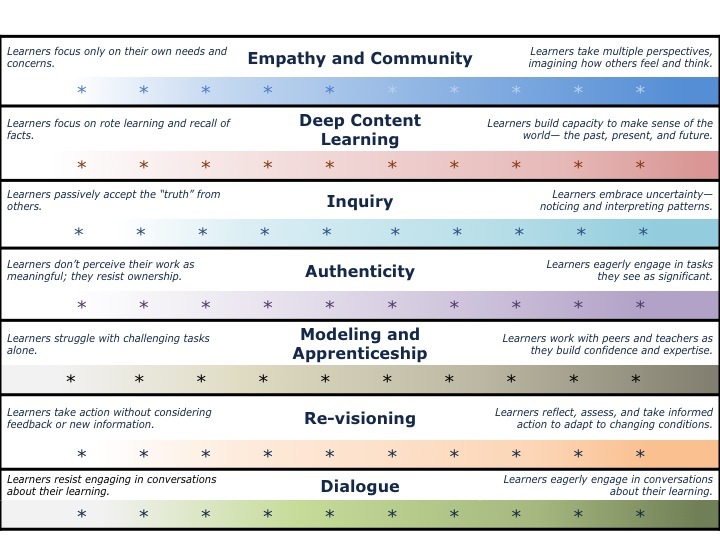 They design lessons that build on what the learners now know and what they need to learn next. Vygotsky called this the “zone of proximal development” — beyond what students can comfortably do without assistance, yet not so challenging that they cannot experience success, even with support. Mentor texts — Choose articles, stories, poems, maps, charts, tables, paintings, videos of performances, or photographs that demonstrate whatever you want the students to learn. Lead the students in noticing and naming what makes the text effective or powerful. Talk about what we can learn from the authors or designers of these texts. Use them as models — copy the structure, the style, the tone. Matching these texts with students is particularly useful for struggling readers. Flexible grouping — Sometimes you want to work with the whole class as you demonstrate a skill or strategy. Sometimes you put them into small, heterogeneous groups–groups where students bring different skill levels in which they can learn from one another. Sometimes you have students work in pairs–with more knowledgeable students working with students who are still learning. Sometimes it’s best for learners to work by themselves, and you move around the room, checking in with individual learners to give them “just-in-time” support. 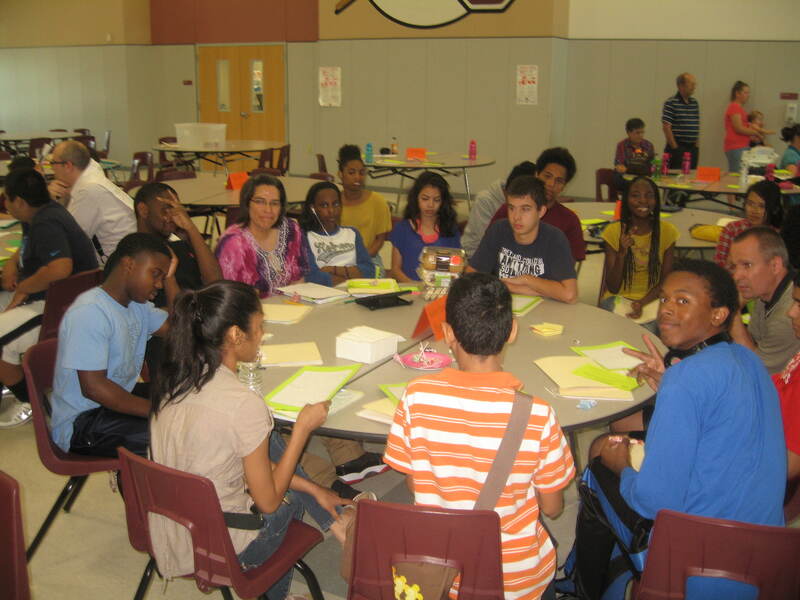 Individual conferences — Powerful teaching happens one learner at a time. Over the years, I realized that my most powerful teaching happened in the moments when I took time to have an individual conversation with one student as he or she was in the midst of a challenging task. Making time for those conversations takes some work, but the pay-off is clearly worth it. In English language arts classes, we call those conversations “conferences,” and whole books have been written to help us have powerful conferences. So . 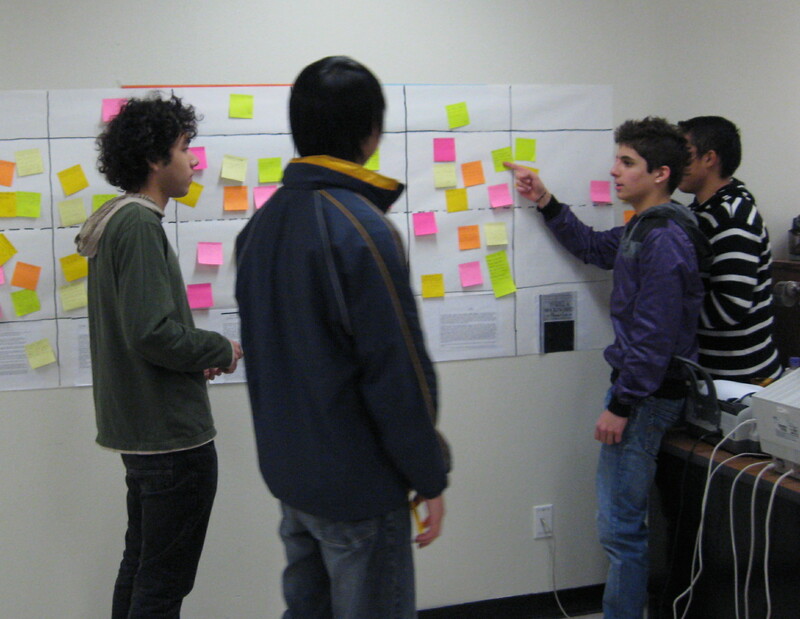 . . organize a learning club in your classroom, and invite your students to join the club! Patterns of apprenticeship show up when when we invite our students into real work — the work of readers, writers, mathematicians, historians, geographers, economists, scientists, artists, musicians, athletes, and more! Smith, F. (1987). Joining the literacy club: Further essays into literacy. Portsmouth, NH: Heinemann. Smith, F. (1994). Writing and the writer. Mahwah, NJ: Lawrence Erlbaum Associates. When I walk into a school, it takes me about five minutes to know whether it’s a powerful place for students and teachers to learn. It’s not about whether they have the latest technology, and it’s not about their test scores. There’s a feeling, an attitude, a tone, a climate on a campus like this–a campus where teachers and students alike can take the risks inherent in authentic learning. What policy-makers do not seem to recognize is that each of these excellent learning places is unique. Powerful teaching and learning cannot be standardized–no five easy steps; no fool-proof method. These powerful schools are by no means the same, but there are similarities–similarities in the ways teaching and learning even in the wide diversity we see across these schools. We use this list of patterns as a springboard for conversations about our goals for learners. There’s nothing sacred about these labels. Some groups decide to talk about “accountable talk” instead of “dialogue” or “modeling” instead of “apprenticeship.” The particular language is not important, but those conversations about the patterns are critical if we want to set the conditions for powerful learning. 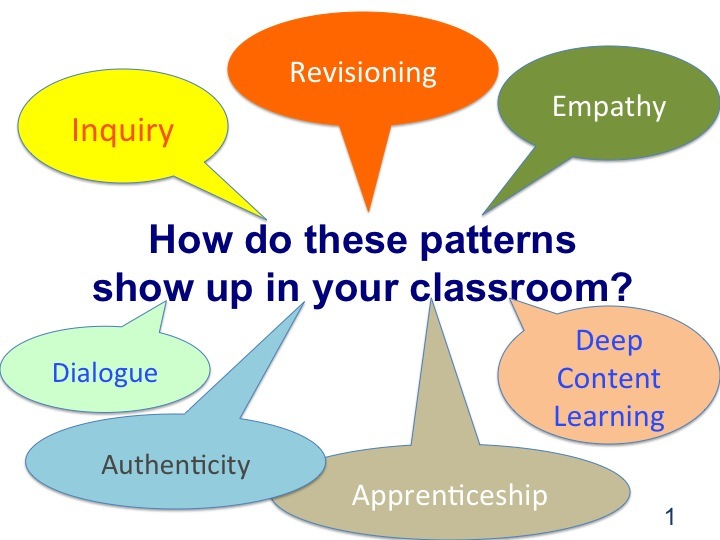 Do these patterns make sense to you and your colleagues? Do they seem true? Do they seem useful? Which three patterns would you choose to prioritize on your campus? Check these out and let us know what you think!